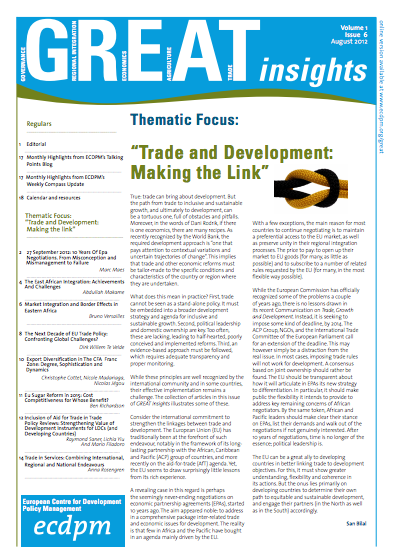 ECDPMGreat Insights magazineThe All-Africa Free Trade Area: Revenge of the Abuja Treaty? The All-Africa Free Trade Area: Revenge of the Abuja Treaty? The Abuja Treaty establishing the African Economic Community almost suffered the same fate as previous development plans for Africa. No sooner had it come into force in 1994 than fresh blueprints sprouted from within and outside the continent, side-tracking the Treaty. 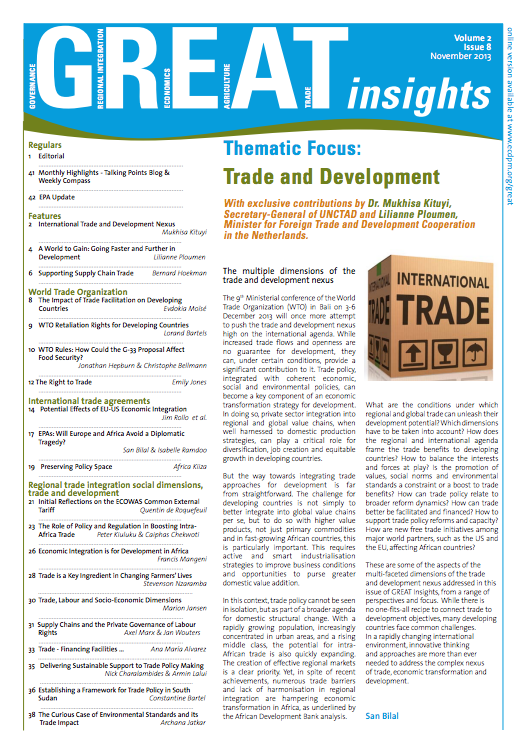 The decision of the African Union to address specifically the critical issue of “Boosting Intra-African Trade” at its 18th Summit of Heads of State and Government and calling, inter alia, for the establishment of a Continental Free Trade Area (CFTA) by 2017, “in line with the timeframe and stages of the Abuja Treaty” is clearly a demonstration of collective wisdom to take the continent’s economic survival and progress in hand. 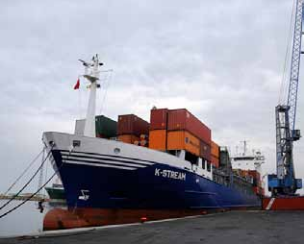 Surely, the tergiversations of the international trading system as indeed the continent’s own stuttering efforts in its economic development agenda have finally led to exasperation point and hence, the CFTA decision. For, strictly speaking, according to the Abuja Treaty, the continent has not quite reached the point for it to embark on this challenging stage of its implementation. Indeed, certain requirements of the first two stages remain unfulfilled and the Heads of State and Government, as stipulated by the Treaty, have not pronounced themselves on the completion of the previous stages for the continent to embark on the third stage. But then, the provisions of the Treaty are not cast in iron, and Africa cannot afford the luxury of time. It is simply not on its side! Judging by the tough situation prevailing on the international front, Africa needs to efforts to demonstrate its capacity of a close fist when it comes to fighting for its interests at the negotiating table. For too long now, it has had to play a kind of second fiddle, if not an outright passive role, at the level of the multilateral negotiations. It has had to fight hard to have its voice heard. This situation has become even more apparent since the inception of the WTO. Those who were in Seattle and Cancun, among other places around the world where these very costly negotiations took place, would remember the raw deals tendered to the African delegations. The so-called Doha Development Round was to have concluded rapidly and ensured the developmental aspect of the new trading system. Lest it be forgotten, the timeframe earmarked for the conclusion of the Round was three years since its launch in 2002! We are now in 2012, and the developing countries, principally the African countries, which hardly have the means or the capacity to partake in these complex negotiations, are practically exhausted. The fruits have not lived up to the promises of the blooms! It should also be remembered that there was a time when the belief was strongly propagated that wisdom on trade policies somehow could only originate from the WTO. Free Trade Areas were decried as being contrary to the objectives of the WTO. Africa showed a propensity to go along with that decree, especially after it was endorsed by the Sutherland Report. The latter lamented the proliferation of preferential trade agreements which were compared to the imagery of a spaghetti bowl. And yet, those developed countries which have always been very quick at pointing a finger at the developing world, concluding that those that were not benefiting from trade needed to fix their governance problems, were at the forefront of concluding FTAs! Moreover, the attempt at dealing with the capacity problems of poor countries in a coherent and comprehensive manner at the WTO has hardly ever been commensurate with the enormity of the problem. There is no strong evidence to support that the WTO has been consistent in responding to the needs of its weakest members and the multifarious challenges they face. The procedures laid down, including the “coloured” rooms exclusive processes, became more difficult, complex and complicated for most developing countries, African ones foremost, to follow and derive consequential benefit. Therefore, the call for a fast-track CFTA is very apropos! The dispersed ranks often demonstrated by our countries and, to a certain extent, encouraged, albeit in a subtle manner by outside players, have played havoc on the continent. That is why this chance should not be allowed to pass. However, the challenges faced by the continent in following through this commendable objective are multiple and need to be overcome with determination and courage. These are quite well known for they are the same challenges that have hindered the timely implementation of many a decision aimed at propelling the continent forward in its quest for integration at all levels. If the African countries can withstand the pressure that will surely come from outside and which may delay the process or sidetrack it, then half the battle would have been won. But the issues that need addressing earnestly to make the CFTA work are endogenous. They are political as well as well economic and practical. Having due regard to the experiences they have so far endured on the international front, African leaders owe it to themselves and to the people they represent not to throw away this chance of seeing the CFTA decision through, while recognising that they will have to agree to certain unavoidable adjustments as the process unfolds and develops. But imperatively, they must ensure that this decision does not suffer the same fate that so many other decisions, resolutions and declarations have known through non implementation. The same political will that has predicated this far-reaching decision will have to prevail for its concrete translation. Certain national interests will have to be foregone in favour of regional and continental interests. The hesitation to proceed that way is politically motivated but needs to be overcome. The way forward in this respect is to involve the people in the process. They should be informed of the decisions being taken in their name and the eventual benefits they will derive from the CFTA after consenting to some initial but unavoidable sacrifices as the technical negotiations take place. Member States will have to understand that in this endeavour they stand to win some and lose some, but that ultimately it would be a win-win situation for the entire continent. A major impediment in the implementation of certain decisions of an encompassing nature in the integration process has been the absence of empowerment of our institutions. 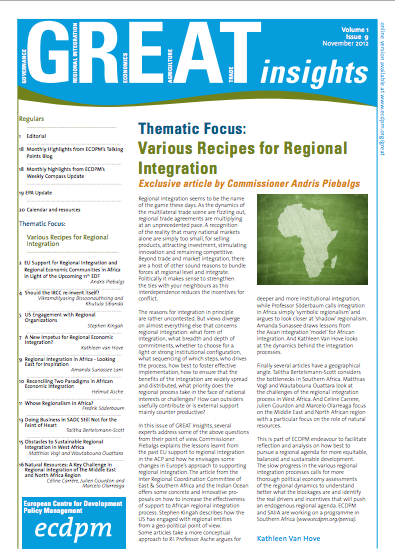 An undertaking of this dimension which has the potential of changing the whole image of the continent, therefore, requires that the process be placed in the steady hands of a high calibre, knowledgeable and competent team operating within the structure of the AU Commission but with a very distinct, precise and independent mandate. That team should be tasked solely with the scrupulous oversight of the implementation of the decisions taken collectively on the basis of its own recommendations. The Head of that team should act as the Facilitator and Convener of the technical negotiations which, if anything, will be very arduous and demand undivided attention. That will free the Commissioners to continue to handle the other responsibilities of their respective portfolios and handle the more general institutional and legal framework that will become necessary to take the process forward. The task is a mammoth one. But the good news is that the continent is not starting from scratch. Lessons should be drawn from the experiences of the Regional Economic Communities. 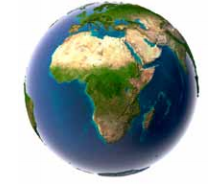 The larger economies of Africa and those that have achieved a certain level of stability through proven macroeconomic reform should pull the rest of the countries through. The tendency to adopt protectionist postures will undoubtedly be there, especially when it comes to such issues as Rules of Origin. However, the increasing interest of emerging economies for our continent will surely drive home the imperative of faster integration of the continent that will provide a large internal market, thus making it possible for countries with such tendencies to reap the benefits of the CFTA. In the same vein, issues like market access and non tariff barriers, common in such endeavours, will need to be put on the negotiating table early enough. Learning from the experience of certain RECs, it is evident that all countries will not be able to move at the same pace. Therefore, it will be necessary, right from the start, to adopt the principle of variable geometry, thus enabling countries so capable to move faster making provision for States with genuine problems, including those mired in conflict situations, to catch up within a pre-determined timeframe. Similarly, the leadership should bear in mind the legacy of colonialism which has left the continent with diverse operational and legal systems: to wit, anglophone, francophone and lusophone most notably. Therefore, problems of policy harmonisation and institutional rationalisation are bound to arise. Unless these are addressed courageously, the first steps may become very laborious to complete, thereby delaying the process interminably. The road to the CFTA will be long and strenuous, strewn with obstacles, some natural but quite a few implanted. It behoves the present leadership to demonstrate the courage of conviction required to bring to fruition this stage in the integration of the continent, a vision cherished by those who had the wisdom and foresight to dream of and believe staunchly in the achievement of a United Africa. Funding this endeavour must come primarily from within the continent. The means to raise community funds have been identified. That particular ball as well is in the court of the leadership. 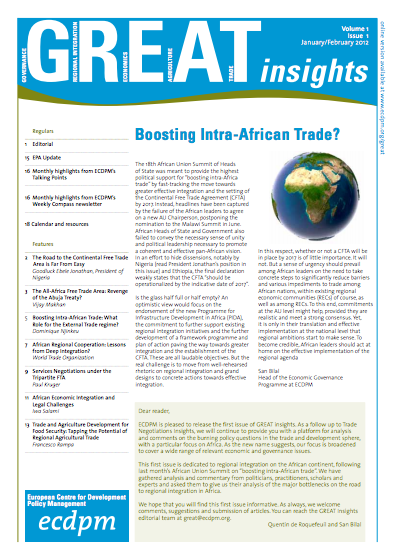 Boosting Intra-African Trade: What Role for the External Trade Regime?